China, Ching Dynasty. Kuang-hsu, AD 1875 to 1908. milled 1 Cash. Emperor : Te Tsung using the title Kuang-hsu. 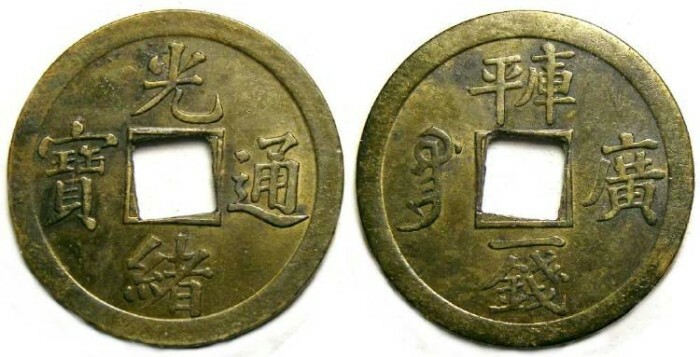 Date : Kuang-hsu ruled from 1875 to 1908, but this particular type was minted in 1889. Denomination : Brass cash. Mint : Kwangtung. Size : 24.0 mm. Weight : 4.01 grams. Reverse : I am not certain what the two characters at the top mean, but the other three translate to roughly "money 1 cash of Kuang-hsu mint".